Today is Superbowl Sunday and go figure, I am working on a new Social Media campaign! Here in the office we have been exploring new outlets to gain interacting followers with Social Media, and we forgot the most important client. Ideas and Pixels! We needed a way to intrigue business owners to become our core group of social media followers. Then it struck me! Even though it was Superbowl Sunday, drinking can wait — I just conceptualized our new Social Media campaign! Our new Social Media campaign involves giving away print collateral for FREE! We would love to run offer more giveaways for your business that could include: indoor/outdoor print banners, window stickers, flyers, card-stock/vinyl posters and so on. 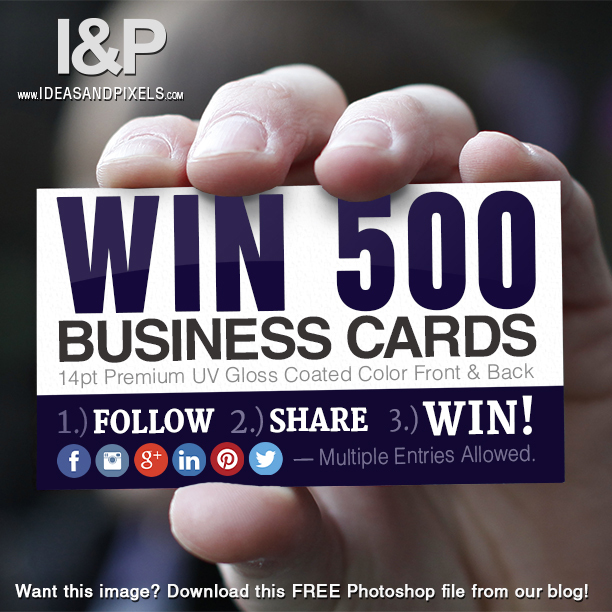 Considering this is Ideas and Pixels first Social Media campaign attempt, we are starting small by giving away 500 Premium Free Business Cards. If this campaign takes off you can be sure that we will offer larger prints, like our $850 vinyl indoor/outdoor banners! Follow Our Social Media Outlets For Your Chance To Win! Now with our new campaign running and how excited I am to watch the Superbowl, well actually to start drinking, here are all of the files I used to make this campaign! Feel free to use as you please, build your own marketing campaign or use on your website website — Heck here is the actual Photoshop file I designed! PSD File of a man holding a blank business card and this social media campaign files! Special thanks to Veodesign for designing some incredible simple Social Media icons for our campaign. Want to use the icons as we have? Visit his website by clicking here! Even more thanks to wpLike2Get for building a simple sharing plugin that was easy to use and add to our blog. Now I won’t miss my Superbowl party! Download this plugin by clicking here!